At the November branch meeting, the beer scores received from members since February 2018 were used to select the winners of this year’s Real Ale Quality award. 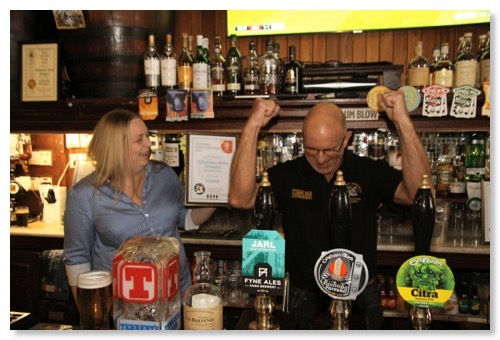 The overall branch winner is the Plough Inn, Leitholm. We plan to do a presentation to them in the New Year. More information to follow. CAMRA Edinburgh & SE Scotland have become aware that, on a few occasions this year, people claiming to be from CAMRA have visited pubs in Midlothian and asked for money to be entered in to a guide. We would just like to be clear that we never ask for money for entry in to our guides or for a posting on our websites. We do sell adverts in our magazine Pints of View, but should you take out an advert you will be invoiced after publication. We may also offer CAMRA Good Beer Guides for sale but in that case, should you choose to buy one, we will hand over the book at the time and give you a receipt.